It must have been a terrifying experience for ten-year-old Jane Eyre (or Jane Slayre in this case) to be confined to the eerie Red Room of Gateshead. Locked-in with no escape. Can you say child abuse? This month, along with my friends at the Dark Jane Austen Book Club, I’m reading (and so thoroughly enjoying) Jane Slayre by Sherri Browning Erwin, as well as re-visiting the original Jane Eyre of Charlotte Bronte. (And I’ll have little time to read much else, as they’re both fairly lengthy). Pulled from the quiet contentment of her window seat, our poor future vampire hunting, Jane Slayre, is cast into the Red Room of the Reed home (just as our heroine Jane Eyre had been) as punishment for simply defending herself. The twist here is that her antagonist is the blood-sucking, nasty-of-nasty’s, John Reed. Truth be told, I always assumed that John Reed would return one day — like a sort of Voldimort character — to inflict more pain and create chaos in Jane’s life. 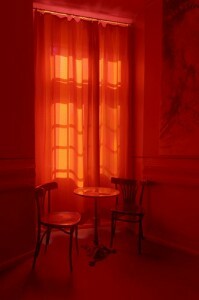 The intimidating Red Room is the room in which the older Mr. Reed breathed his last breath. Rumors of hauntings and talk of his roaming spirit add to its chilling reputation. Red walls, red velvet drapes, red pillows and such (with no Pottery Barn shades of sand to break up the severity in decor and absent of any trace of feng shui) along with drops of Jane’s blood dripping from her injuries make this scary red room even scarier and redder. What makes the Red Room (not to be confused with REDRUM from The Shining) so creepy? The color red. Darth Vader’s light-saber is also red as is all evil Jedi knights. Red may also represent good…but not very often. Our heroines, Jane Eyre and Jane Slayre overcome the wrath of the Red Room (that’s fun to say) with newly found strength. Something happens within those four red walls allowing Jane to face her fear, move on, and be fearless henceforth. So, no need to rethink the color of your cranberry-colored den. Red is just a color. Though the callous walls of the Reed’s home may be red, it is also the color of love. What are your thoughts on the color red? *Photo: read dream by extranoise, obtained through Flickr.